Once upon a time there was a river called Bear. This river had indigenous names also, Nem Seyo, Kumim Seyo. It was once huge, churning, voluminous water carving out a wide canyon with its power. The indigenous people of the area called it Big Water. Then one day a creek completed its headcut and a ridge that had held the Bear back, gave way. 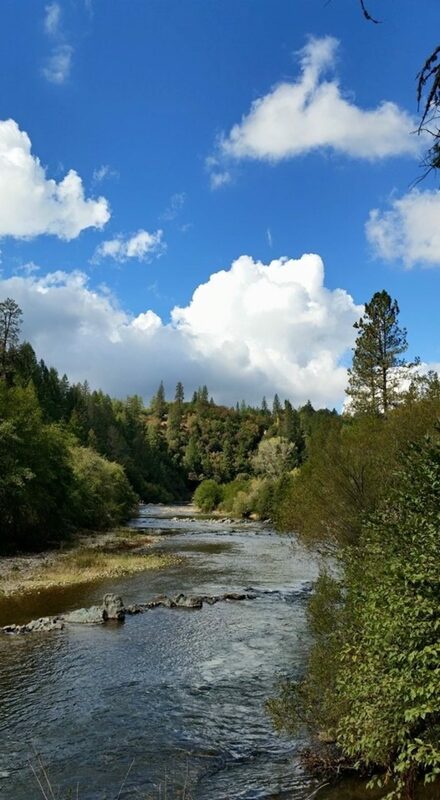 The great water turned west into a river called Yuba. The Bear became the Silenced River, its headwaters now diminished and below the snow line. Our River continued that way for a very long time. One day masses of other people came from far away. They took the water and used it to wash away the land until the Bear became filled with sands, gravel and cobble stones. They killed the indigenous people in very ugly ways. Later these same people took more water from the Bear and mixed the waters so much that the Rivers were all confused. The Silenced River just kept on flowing with what it had left and what the new people ran down it; for most of the water went down alongside the river in a canal. What was left of the indigenous people and some new people came to the river. Local governments promised a fishing access to the people around Colfax in perpetuity they said. Then there were diversions, powerhouses, dams, pipelines and canals where all the water went and the Silenced River just kept quiet. No one thought much of the river and it became the disappearing river. Many of the local people got to know this river and its quiet ways. Because of the wide bottom, elders and disabled people were able to get down to the water. The nearby townfolk lost their community pool so the Bear got more attention as time went on. Slowly people from all over started coming to camp and enjoy the little, calm River. This Nem Seyo and the ancient trees lining its banks watched the seasons and the times change while dams were built and the indigenous people, their burials and the ceremonial grounds were almost all inundated. The last little bit of river, where the people could come down to pray, was all that was left. One final dam was planned by the children of the others to take the last of the water, the rest of the land, and keep everyone else away. This is when something extraordinary happened. Sparkles of sunlight started coming up from Bear River, Kumim Seyo. The people who came to the river felt something in their hearts that woke them up. They looked out across the flowing water and felt the presence of ancient people still living alongside. The many birds and mammals started speaking to their hearts. The plants and trees started stepping up in their glory, taking turns as each came to full bloom. The heaviness of the modern times was lifted and the People’s eyes were opened. They saw that the water fed the life in the whole canyon. They saw how each part of that life depended on the others and how they too were breathing with the wind, flowing with the water, as the sun warmed everything. And that is when the heartbeat was first noticed; because such a living breathing being must have a heart. The heartbeat made a rhythm and the blood flowed in the veins of each person like the River, like the Living Water inside, and outside. The People finally started listening and heard the river song. Bear was singing beautiful songs as the rocks rumbled along the bottom. The Mother Drum came to the river to pray songs that went up beyond the sky and down into the Earth through the river rocks. Nem Seyo heard the love in the People’s voices and determined to stand against the dam threat. That is when the other voices joined; first a few, then many allies. The surviving indigenous people looked out and saw that it was safe for them to speak their truth publicly. The trees responded with joy as the Great Healer, River of the Round Houses, loved by the People from all walks of life, united the Hearts. Oh, Mother carry me, your child, I will always be. Oh, Mother carry me, around to the sea. The River of love grew, the voices joined into a great wave of understanding about the Living Water that is our Bear River. Kumim Seyo, River of the Round Houses, is still flowing and growing around to the sea, the Mother of Waters. Our hearts are again One as we sing together, Bear River. Is Living, Living and Giving. Bear River is living all around to the Sea.